Above, a custom borderless Form with a Panel as the Title Bar is being used to drag the Form. 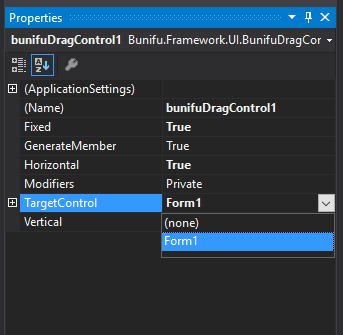 Above, a button that was set as the TargetControl at design-time is now draggable at runtime. Now just run the app and click in any place on the form and then drag it. You will see that the form can be moved (dragged) on the screen. Vertical - When applied, this property allows the user to move the form on the vertical axis. This property is of boolean type. Horizontal - When applied, this property allows the user to move the form on the horizontal axis. This property is of boolean type.